The MicroKORG S from Korg is a synthesizer/vocoder housed in a compact but rugged enclosure and features thirty-seven velocity-sensitive "Natural Touch" mini keys and an integrated high-quality 2+1 sound system. Combining analog modeling with a vocoder provides the user with a wide range of styles and sounds. The microKORG S features an updated sound set with 256 presets and 64 user sets for saving your own creations. What's more, eight favorites can be saved to the quick program selection for quick performance sets. The vocoder consists of an 8-band filter bank that simulates the sounds of the past, while also allowing for filter-frequency shifting (Format Shift), or adjusting the level and pan of each band to dramatically change the overall character of a sound. A gooseneck microphone is included. Two master effects utilize the effect engine from the company's Kaoss Pad series, with a total of seventeen types including delay and echo, a ring modulator and grain shifter. Time-based effects can be synchronized to MIDI clock. 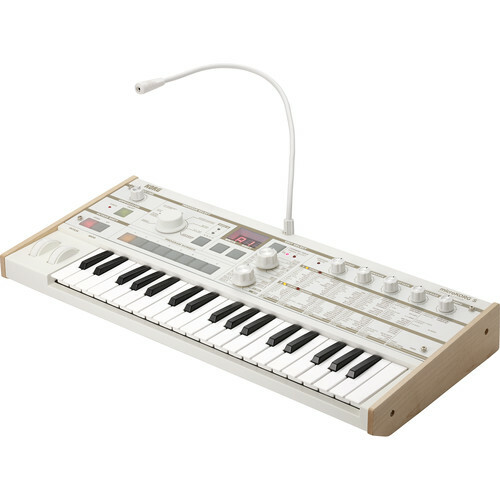 Box Dimensions (LxWxH) 26.0 x 12.0 x 5.3"
microKORG S Synthesizer/Vocoder is rated 5.0 out of 5 by 1. Rated 5 out of 5 by Andrew from Out of this World Improvements, Amazing Synthesizer! I've had this synthesizer for a little less than a year now, but have owned the original Microkorg since 2010 or so. Man! This thing is pumped with all the improvements you wish you had in the original Minikorg! The Speaker ultimately made this synth a must have for me, and it's really solidified my opinion on how great it is! I no longer have to unpack my amp, or configure a chain of signal routing just to get a sound from my Microkorg. This thing allows me to turn it on, and jam out in the open air. No headphones, or amps required. The New sound bank is cool, but not really anything to ditch your old Korg for. What's impactful is the D-bank of empty patches, that you can sculpt and save for. Now I'm no longer deleting factory presets when I create a cool sound. The vocoder is nice, and upgraded with 8 new Vocoder patches. The one we all want (A Dry Input) has now been installed, as well as a few robot voices, and sound that aren't so cheap. The color is kinda bland, but a few sticks never hurt anybody. The LED colors have been modified as well, in a better way. If you've never owned a Microkorg and have always thought about buying one, I HIGHLY recommend you get this! It's a GREAT started toy into synthesis, and when you really get into the bare bones of sculpting waveforms in the menus, you'll find you can do so much with this synth.